6 Step Rolling Maintenance-Mechanics Ladder with Grip-Strut Steps, 60" Top Step Height, 450 lb. Capacity, Steel with Gray Powder Coat Finish. 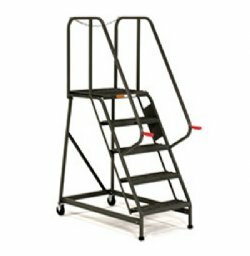 6 Step Rolling Maintenance-Mechanics Ladder with Grip-Strut steps are ideal for workers on the go and serve a variety of applications around the warehouse or shop floor. Meets or exceeds OSHA specifications.